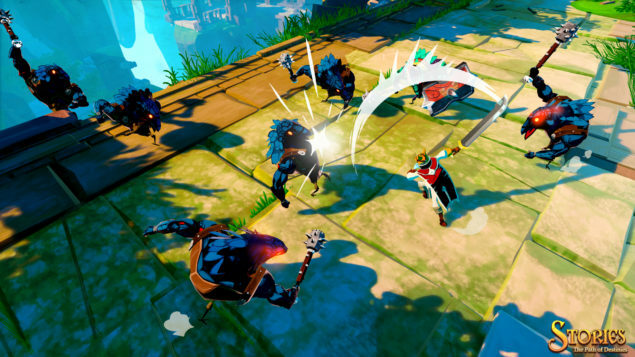 Stories: The Path of Destinies (previously known as Stories: The Hidden Path) is a fantasy action RPG being developed by Montreal based indie studio Spearhead Games. Steam gamers might know them as the makers of ACE – Arena Cyber Evolution, a Free-to-Play Multiplayer Online Sports Arena now available on Early Access. The game, built upon Epic’s increasingly popular Unreal Engine 4, is due for release soon on PC and PlayStation 4 which is why we have reached out to the development team in order to learn more about it. Malik Boukhira, Co-Founder of the studio, confirmed that Stories will run at 30FPS on PlayStation 4; we also asked him why the team chose Sony’s console instead of Microsoft’s Xbox One. Our first game, Tiny Brains, was a launch title for the PS4. Since then we developed a great relationship with Sony, as well as a good experience working on the platform, so it was a natural choice for us to aim for PS4 first. Regarding Xbox One, it’s a possibility we are investigating, but nothing is confirmed at the moment. Sounds like there’s a chance to see Stories: The Path of Destinies on Xbox One, though it will probably happen some time later than on PC & PS4. Stay tuned for a lot more from our exclusive interview with Spearhead’s Malik Boukhira.